Pronunciation is not an optional extra for the language learner any more than grammar, vocabulary or any other aspect of language is. If a learner’s general aim is to talk intelligibly to others in another language, a reasonable pronunciation is important. A teacher has to give due attention to it along with everything else. Pronunciation is not based on spelling. Language is primarily an oral phenomenon and in many respects (but not in every respect) the written form can be considered as a kind of representation of the spoken. Ideally the spelling system should closely reflect pronunciation and in many language that indeed is the case. But unfortunately this is not the case in English, the nature of the problem is twofold. Firstly each sound of English is represented by more than one written letter or by sequence of letters; and secondly, any letter of English represents more than one sound or it may not represent any sound at all. Pronunciation is more than a matter of consonants, vowels and diphthongs. While listening to the sound of people speaking we listen out for the rise and fall of pitch (Intonation), the passing and grouping together of words and phrases and the highlighting of some syllables and the virtual suppression of others and we realize that there is more to pronunciation than uttering different sounds. The accented and unaccented syllables matter a lot. This pacing of speech, this springing from one accent to the next regardless of the number of intervening unaccented syllables leads us to consider the matter of weak forms. Use of weak forms promote fluency which is an important feature of spoken language. “One of the most striking features of English pronunciation is the phenomenon known as ‘gradation’. By gradation is meant the existence in many common English words of two or more pronunciations, a strong form and one or more weak forms, weak forms occur only in unstressed positions; strong forms are used chiefly when the word is stressed, but they also occur in unstressed positions”. While giving information about accented and unaccented syllables J. D.O’ Connor writes. “Syllables which are not stressed often contain in the vowel/ /instead of any clear vowel, and this vowel / / only occurs in unstressed syllables, never in stressed ones”. (1992-91). Connected speech has its own rules and imposes many changes on the separate words that it is made up of. Every utterance is a continuous, changing pattern of sound quality with associated features of quality, pitch, and stress. In connected speech a word is subject to the pressures of its sound environment or of the accentual rhythmic group of which it forms part. Such variations my affect the word as a whole, e.g. weak forms in an unaccented situation or word accentual patterns within the larger rhythmic pattern of complete utterance; or may affect more particularly the sounds used at word boundaries, such changes involving a consideration of the features of morphemes and word junctures, junctural assimilation, elision and liaison forms. Almost all of the words that have both a Strong and Weak Forms belong to a category that may be called grammatical (function) words—words that do not have a dictionary meaning in the way that we normally expect nouns, verbs, adjectives and a adverbs to have. There is a limited number of such words that can be pronounced in two different ways i.e. one strong pronunciation and one or more than one weak pronunciation. ‘ I have a good book’. There are five words. The second, fourth and fifth words are stressed, whereas the first and third are unstressed. As a general rule we can say that we stress those words in connected speech that are important for meaning. They are generally content words—nouns, demonstrative and interrogative pronouns, principal verbs, adjectives and adverbs. Structural words—articles, personal pronouns, auxiliary verbs, prepositions and conjunctions—are normally not stressed. They come in their strong forms only when they are said in isolation or under special situations. The extent of variation in weak forms depends largely upon speed of utterance, the slower and more careful the delivery the greater the tendency to preserve a form nearer to that of the isolate word i.e. the strong form. Weak form have one of the following prominent features. Reduction in the length of sound. Elision of vowels and consonants. In such cases it is generally found that the weak form has / / where the strong form has some other vowel. In certain contexts the strong forms of the weak forms words are used. The strong forms is used when a weak form word occurs at the end of a sentence. Where are you from? Many weak form words never occur at the end of a sentence e.g. the, your, etc. some words particularly certain pronouns occur in their weak forms in final position. 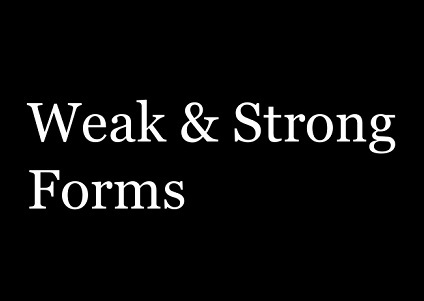 A strong form is used when a weak form word is contrasted with another word e.g. The letter’s from him, not to him. Same is the case in co-ordinated use of prepositions e.g. I travel to and from London a lot. A strong form is used when a weak form word in given stress for the purpose of emphasis,e.g. You must give him more money. 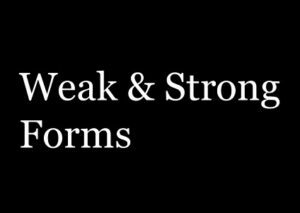 A strong form is used when a weak form word is ‘quoted’ or ‘cited’, e.g. You shouldn’t put ‘and’ at the end of a sentence. Another point to remember is that when a weak form word whose spelling begins with ‘h’ e.g. ‘her’, ‘have’. Occurs at the beginning of a sentence, the pronunciation is with initial ‘h’ even thought this is usually omitted in other contexts. A contraction is a shortened form used either in speech or in writing. In speech some words combine together to form contractions. These are represented in writing that reproduce spoken language (e.g. drama, direct speech in novels, short stories), by omitting one or two letters and replacing the letters that are omitted by an apostrophic (‘). In speech there is an area of overlap between weak forms and contractions. Weak forms (e.g. the weak forms of be and have) are used throughout connected speech in close proximity to a wide range of vocabulary. When personal pronouns are combined with the auxiliary verb be and have, the auxiliaries take their weak forms. These are spoken as weak forms and may be written as contractions e.g. ‘she has’ –‘she’s, ‘they have-‘they’ve. The proper use of weak forms is essential for a correct pronunciation of English, and is on of the most difficult features of English pronunciation for foreigners to acquire. Foreign people generally have an almost irresistible tendency to use strong forms in their place. It is possible to use strong forms only and some foreign learners do this. Usually they can still be understood by other speakers of English so that question arises why is it important to a learn how weak forms are used? There are two main reasons. Most native speakers of English find an ‘all strong form’ pronunciation unnatural and foreign sounding. The second and most important reason is that the speakers who are not familiar with the use of weak forms find it difficult to understand speakers who use weak forms. So it becomes compulsory from practical point of view to learn weak forms. Teaching programmes must include this feature in their curricula and foreign learner can help themselves by paying more attention to their listening skills. Exposure to native speakers speech helps in improving the pronunciation. Correct use of weak forms can also be acquired by continual reading of phonetic transcription. In a few cases there are rules which help the learner. Hubbard Peter et al (1983), A Training Course For TEFL, Oxford University Press. Jones Daniel (1976) A outline of English Phonetics, Cambridge University Pres. Gimson A. C. (1980). An Introduction to the Pronunciation of English. Revised by Crittenden Alan (1994). Gimson’s Pronunciation of English. Roach Peter English Phonetics and Phonetics and Phonodgy. Saifullah M. Main An Approach to the study of Linguistics.